Summary: How much does it cost to build a house? Professional builders know the current cost to build a new home is $89 to $160 per sq ft, or more, depending on the home’s size, design, quality, and location. These costs per square foot do not include the cost of land, local impact fees, financing costs, marketing costs, or sales commissions. The cost of land or building site varies tremendously depending mainly on location. 25% material, 25% labor, 25% land cost, 12.5% builder profit, and 12.5% builder overhead, which includes the cost of running their business, construction financing costs, and the new home’s marketing and sales costs. All builders must constantly balance the material, labor, land, and overhead costs when estimating the costs of building a new home. This is what construction cost estimating is all about. 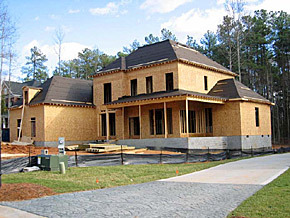 When you build your own home, you will only have to worry about land, labor, and material! But, if you want an expensive roof, or special doors or windows, or other expensive building materials, or your contractor bids are high, you have to compromise and spend less on other building categories in order to stay within your home building budget. All this compromising and cost balancing is done in the planning stage of construction. On my Getting Started page you’ll find excellent, easy to use, and FREE cost estimating software called Cost to Build Calculator, that utilizes the latest in construction estimating software. The software allows you to vary the design, quality, size, and zip code of any house plan to get an approximate cost to build estimate. For more accurate cost estimating read my Cost Estimating Explained page. It discusses the entire process of cost estimating, as well as using a spreadsheet to control costs. -If you are your own General Contractor, you’re in charge! -Try to keep costs as low as you can.-Use a spreadsheet to track category costs! -To make this job easier, use a properly formatted spreadsheet. Being properly formatted makes the job easier. There are free formatted spreadsheets on my spreadsheet page. Cost Estimating is the #1 job for a General Contractor. Nothing else comes close. You will discover as you explore the Cost to Build Calculator that the difference in cost per square foot is due to many variables, including home size, foundations, roof pitches, quality of building materials, home design, and so on. Below are four examples of how the cost per square foot can vary by as much as $71 as these variables come into play. 2,000 sq. ft., simple design, concrete slab foundation, low roof pitch, etc. @ $89 per sq ft = $178,688, Materials and Labor. 2,200 sq. ft. steeper roof, better windows, stone trim, etc. @ $109 per sq ft = $239,318, Materials and Labor. 2,400 sq. 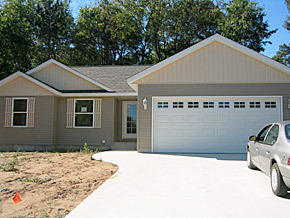 ft., more windows, large covered porch, hip roof, etc @ $125 per sq. ft. = $299,784, Materials and Labor. 2,600 sq. ft., more complex design & costs, etc. @ $160 per sq. ft. = $414,871, Materials and Labor. Note: All the above estimates are from the estimating software and are for Charlotte, NC, and are rough (approximate) estimates for 2019. The term cost per square foot or average cost per square foot for a new house needs to be used wisely. I use it as a target figure to control my home building budget, as most builders do. 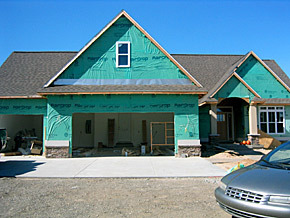 For more on this subject, read my Home Construction Costs.